I am always on the look out for new beer and on a recent trip to Vermont I stopped at the Hunger Mountain Coop which has a great beer selection. Unfortunately they had no Heady Topper or Lawson’s Finest Liquids but they did have some beer from AleSmith and others. AleSmith is a brewery based in California that does not distribute to Maine so when I saw this beer and their Speedway Stout I decided to grab both. This is an American Pale Ale or as they describe it an Extra Pale Ale. The beer pours a clear pale orange with a solid white head. Some hops come through in the aroma but overall not much happening; a little citrus and maybe some grapefruit. Taste is good but not great, mild citrus balanced well with some sweet malts. Nothing outstanding but certainly drinkable and quite refreshing. Overall this is a quality beer but when I think of Maine Beer Company Mo and Hill Farmstead Edward this one just doesn’t stack up. 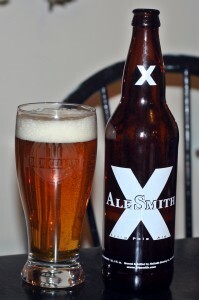 Brewers Description: AleSmith X is our refreshing Extra Pale Ale. Pale Yellow color, bright white head. Aroma of fresh hops with notes of citrus and pine.